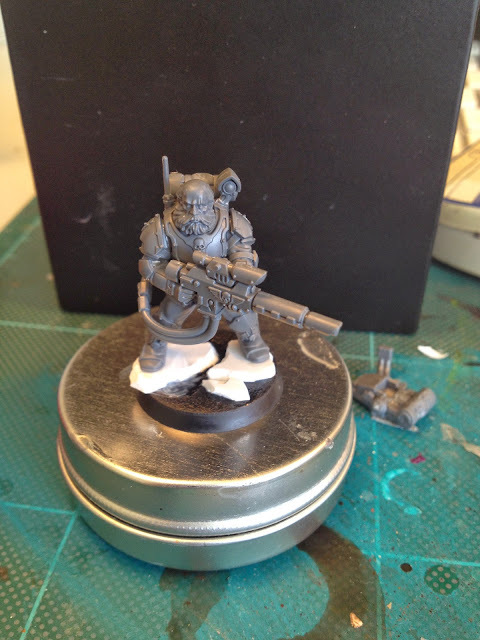 Finally - after a period with little time and even less enthusiasm for modelling, the release of the new storm troopers / scions / militarium tempestus ("a beloved child has many names" as we say in sweden...) has yet again spurred me into action. 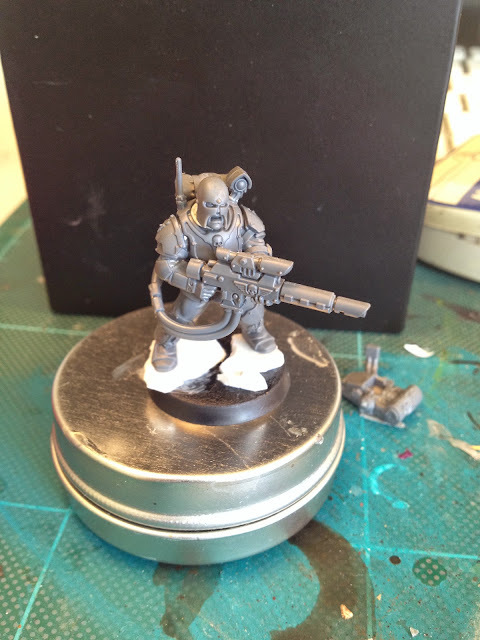 The kit is simply amazing - arguably one of the best GW has ever produced - and the modelling possibilities for those with inquisitorial leanings are endless. 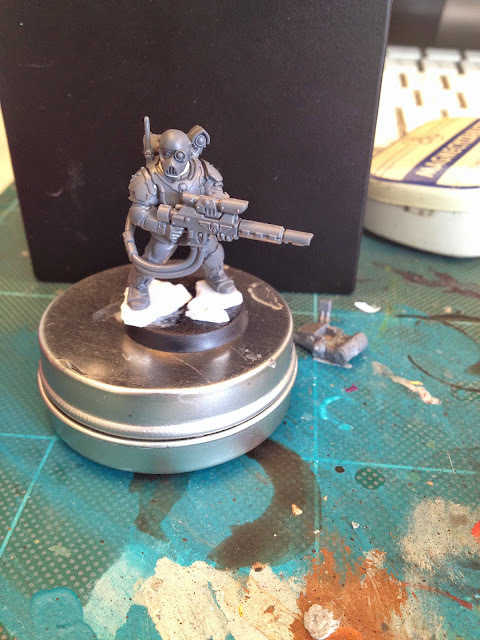 The sprues are just teeming with useful bitz (stars of the show being the powerfist and tempestor coat). I did however try out some alternative heads before glueing on the helmet. Some of theese look pretty cool and illustrates how versatile this kit can be - a simple head swap can completely change the mood of the model. They look great! 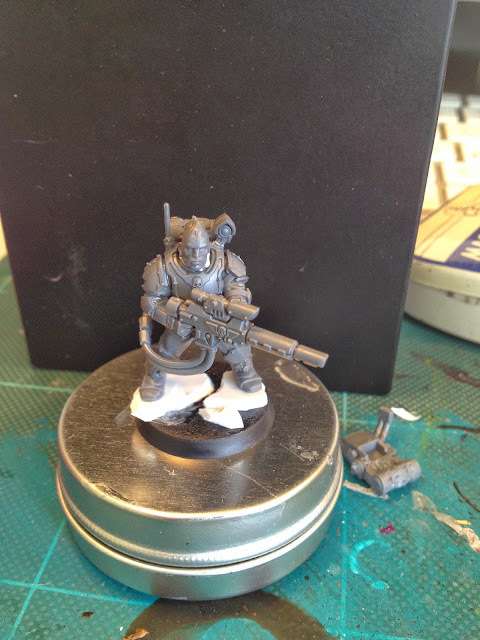 It is a very exciting kit, the first in a while that really shines with Inq40k potential. I cannot wait to try my had at converting a few and look forward to seeing what you come up with. 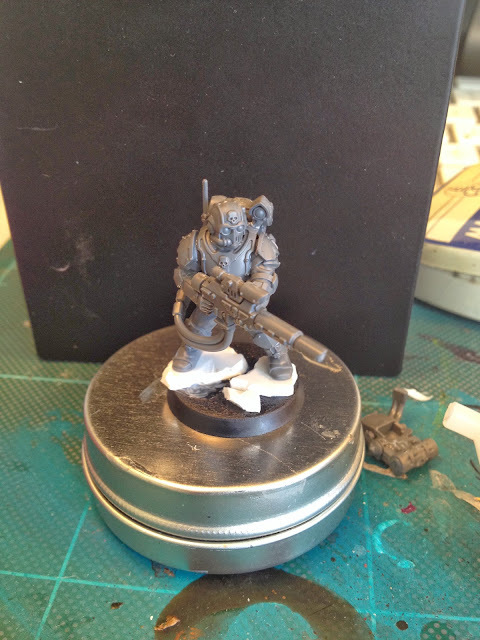 I really like that Space Wolf head on him; he reminds me of Colm Corbec! It really is an awesome kit and has impressed me a great deal. What impressed me the most was a very simple detail on one of the hellguns held at ease. The operator does not have his finger on the trigger of the rifle! 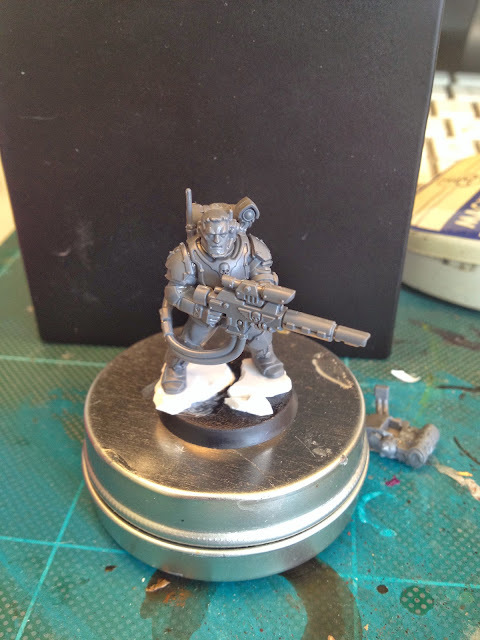 This i think is the first instance where a GW model is practicing trigger control (only proper for such highly trained soldiers!). In general their hands are modeled very nicely. I was also really happy with the range of heads in the kit (17 I believe), particularly with the berets. The heads do a great job of taking visual aspects of all the previous storm trooper releases and merging them together into something new. Looking forward to seeing what you do with the rest of the ones you have! I'm keeping the knifes for other purposes... Assassins!! Thanks for posting this. It's really useful to see miniatures in their bare plastic form when I'm trying to figure out what I could do with them. I agree that they look like fantastic miniatures. I think I'll be buying a box of these and I'm looking forward to seeing what you do with them. Echoing MonkeyBallistic - its great seeing kits built in the bare plastic - really helps you see the potential in a kit. The stock model and the Wolf head one are my favourites - looks like lots of very cool potential to mix parts onto the basic frame. Valkyrie pilot, definitly. Gives him a very strange look.